Apologies for the lack of enthusiastic posts in recent weeks. It's been a sort of crappy end to a year of extremes - the highs of a new marriage to the letting go of the only home two kids had ever known. The buying and selling of homes in a down market, the challenges of promoting artistic projects in a slow economy, the hand-wringing and hair-pulling of raising a couple of highly-intelligent and often challenging teens, and integrating a new maternal influence into their lives. It's all been a lot to absorb, much less report on with any sort of regularity. Safe to say, things are settling down on the home front, just in time for things to get busy on the career front. There is movement on the horizon, and I look forward to writing about it next year. I've polled several of my friends and family, and I'm not alone in thinking this holiday season has been more crabby, bitchy and altogether more grrr than in recent memory. Everywhere I go, people have their blinders on, sometimes even walking right into me - imagine missing a 6'4" 250lb linebacker - with only a surprised look and not so much as a "pardon me". On the roads, it's worse. People stealing parking spots, ignoring basic traffic rules and no concept of common courtesy. I know that Mars AND Mercury are both in retrograde and the economic environment is dodgy at best, but relax, people. 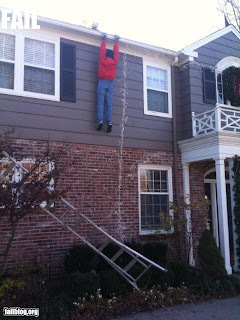 Just be aware of your surroundings and maybe cut your fellow man some slack this particularly rough holiday season. Isn't that what it's all about anyway? As previously mentioned, The Wife was in a car accident last month and her poor Ruby was totaled. Well, not that either of us wanted to be car shopping the week before Christmas, but she ended up with a very nice replacement. Her blog post is here. People seem shocked that she's not very enthusiastic about this new vehicle. I told her the other night that it made me sad, but that I understood. I told her that people used to ask if I just LOVED my rebuilt home, and I would tell them I didn't really want the old one to burn down, but if something was going to come at such a high personal cost, then a rebuilt home with upgrades was better than the charred, blackened version. Same with the car. She didn't want to total Ruby, but if she had to lose Ruby, this is a darn fine vehicle to drive in her stead. 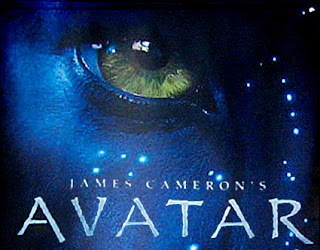 In other news, I took Kayleigh to see James Cameron's Avatar in 3D IMAX today, and it rocked my world. It pretty much rocked Kayleigh's too. I can see that I'm cultivating an appreciation in her for things like cinematography, sound design and production design. There's a lot of hype surrounding this film. It's James Cameron, after all, and if he's good at one thing, it's generating hype. I avoided watching Titanic for years just because of the overmarketing and endless hype. But as a guy who builds sand castles and sandboxes for a living (meaning worldbuilding for narrative and interactive media), the moment I saw teen-foot-tall blue aliens riding quasi-pteranodons through a bioluminescent primeval world, I was hooked. I simply HAD to see it. They had me at "flying lizard". First, let me say that nobody is going to win any acting awards from their work on this film, which I actually find sad. It's got to be brutal to have to work your craft wearing a green bodysuit in a green room with ping pong balls as reference points. But this movie isn't about breakthrough performances. Sometimes, "acting" just gets in the way of the story and takes me out of the setting. That said, Sam Worthington (Macbeth, Terminator Salvation and the upcoming Clash of the Titans) is completely credible in the lead role, and the supporting cast is made up of talented newbies and journeymen actors alike. Giovanni Ribisi is a really great corporate whore, Stephen Lang is menacing (if a bit two-dimensional) as the jarhead Colonel, and the main Na'vi characters are brought to life by some fine talent, including Wes Studi as the chieftain, CCH Pounder as the shaman, and Zoe Saldana as the love interest. Sigourney Weaver's performance was surprisingly wooden. Keep in mind, some of the criticism Avatar has faced (lackluster acting, simplistic story) was also thrown at a certain sci-fi blockbuster in 1977 - which spawned an entire media empire and popular subculture. Minor performance quibbles aside, Avatar is important, and I'll tell you why. On the technical side, it has changed the way blockbuster movies are made. And whenever technological advances are made in Hollywood-scale cinema, that technology trickles down to the indie guys, who make better, more creative use of it more cheaply. On the story side, as much as it is an archetype (see Dances With Wolves or Heart of Darkness), it is a really serious look at our own world through the lens of sci-fi escapist entertainment, sort of what the original Star Trek series did. The basic premise (no spoilers) is that an invading population wants a resource that the native population considers sacred, and that the invaders de-humanize the natives to justify their removal and, if necessary, their genocide. It is our own American history, our broken treaties with the native populations, our strip mining, gold rushes, our smallpox-laced blankets. It is our shame as a nation, and unfortunately we are not alone. It is Belgium in Rwanda, Spain in South America, France in Southeast Asia, Britain everywhere they put down stakes, Australia's treatment of the aborigines. And yet at the same time, you forget you are seeing our own history and maybe learning something because you are watching compelling science fiction. It always makes me happy when a movie transports me into its world and makes me feel any sort of emotion; it means the film is doing its job. Avatar is very good at placing the viewer in the world. 3D IMAX may have helped in that regard, but more than anything I think it was just a really well-designed world. The ecosystem made sense. There wasn't anything that felt out of place or just there for the hell of it. Even my 12-year-old daughter remarked afterward, "I really felt like I was there." And the sociopolitical message wasn't lost on her either. I felt it was a good film, both in technical polish and in message. Recommended viewing, on the big screen. Last week was pretty much a loss, energy-wise, and this week has not started so well either. We're keeping busy around the house. The granite countertop finally came in, so now the section of kitchen by the stove looks more or less like the rest of the kitchen. So there's that. Christmas cards have been pouring in, along with prezzies from the family. A couple boxes showed up from the new in-laws last night. Mrs. D. and I each got to open one (not all the way, just to get the wrapped presents out), and I stowed the wrapped packages neatly under the tree. I'm taking bets on how long the bows stay on, since under the tree is where Elvis and Tom like to wrestle, lie about, and gnaw on whatever they can find. Work has begun in earnest on Arrowflight Second Edition. Deep7 fans have only been demanding it for about five years now, and I need to bolster the company bottom line with some new product. Steve Hartley will be the go-to illustrator, and we've already been in Skype conference mode. Next week will include a couple face-to-face art meetings. I learned a lot on RADZ, and I intend to put that to work to benefit Arrowflight. Happy with it so far. Although we managed to knock out most of our Christmas shopping last weekend, I still have a few more things to pick up, and some errands to run (including a Christmas Card drop at the post office). Better hit that before the weather goes all wonky again. On this day last year, on the very day an arctic front blew in and started Snowmageddon '08, I took Raechelle to Alki Beach and asked her to be my wife. Three guesses what the answer was (and the first two don't count). Where did this last year go?? I guess we've been keeping busy. Mrs. D. and I went Christmas shopping yesterday and just about knocked it all out. I got my second wind about 4PM, which is odd, because I'm usually wanting a nap around that time. We went up to a musician friend's birthday celebration/jam, and we brought Kayleigh with us. She was a big hit, singing songs into the mic and whacking away at the tambourine. I got to strum, Raechelle got to sing. A fun evening for all. Today consists of a meeting with Ron, some football, and a film screening this afternoon. Seems like even when we don't plan out a weekend, it ends up cramming itself full anyway. I never understood if the lyric meant that we kids should be good for the sake of being good (which seems like sort of a weak argument to most six-year-olds), or more like it was being barked by a tired, cranky parent during holiday purchasing at the mall: "Be good, fer cryin' out loud!" Kayleigh just tested for her green belt in tae kwon do! She's got one more level of green after this, and then she goes into two levels of blue. She's doing very well, and we're really proud of her. In other news, I woke up this morning [blues riff here], and stepped in cat barf. It should be said that stepping in cat barf (in bare feet) first thing in the morning is one of my least favorite activities. Actually stepping in cat barf at any time and in any footwear at all hardly makes the must-do list of pastimes. I should have been more vigilant, but even living with a bulimic feline, I truly didn't expect to make such a warm and squishy footfall so early in the morning. Later this morning, while getting dressed, I stepped in a cold puddle next to my bed. Apparently the cats had decided to go after my water glass. I threw a towel down to sop it up and quickly inspected the Alphonse Mucha prints stacked nearby for damage. There was some. I don't know how extensive yet. I loaded Tyler into the car, cursing my feline housemates, unable to thaw my windshield with frozen washer fluid sprayers. Then we sat in downtown traffic for an hour and a half. Let me repeat: it took an hour and a half to get from West Seattle to the University District. Fortunately the folks at the CHDD Autism Center were very forgiving, and we were able to continue with the diagnostic clinic. We'll know more later this month. That's all I've got for now. Kayleigh's band concert is tonight, after which I will be collapsing in bed for immediate dust-off and evac. And tomorrow morning, I'm wearing my slippers. Mrs. Downing's faithful readers know by now that she was in a five-car pileup on her way to work a couple weeks ago, and that as of yesterday, her dear Elantra hatchback, Ruby, was totaled. I know firsthand what it's like to lose a beloved vehicle, and I know I'd be a pouty boy if Sportacus was ever totaled. But it's hard to give comfort during the transition. I have to remember that there's no quick fix, and you have to let the grieving own their grief. The reminder actually came to me as I was surfing for cars on the laptop last night. Hyundai doesn't make an Elantra hatchback anymore, and Mrs. D. doesn't want a used car to replace Ruby. So in poking around through equivalent cars, I brought up some Hondas and Kias, but the look on her face said, "nice try, but just let me be sad right now." I didn't want to seem like I was trying to influence her decision in any way (only window shopping for my own edification), so I put the laptop away and let her be sad. Sometimes it's okay to let your loved one be sad. Sometimes it's okay just to be quiet and hold them. There have obviously been some major events in my life since I stopped the Rhymes With Drowning blog and launched Life 2.0. Much of this past year has been spent talking about the impending move and wedding, and now that those things have happened, I find myself wondering which direction to take this blog. Rhymes With Drowning was a very public yet very personal journal of a single father going through several kinds of compounded grief and loss. 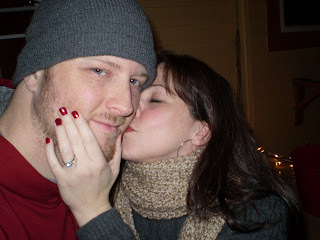 It made sense that when I met my wife-to-be, life had very visibly turned a corner, and Life 2.0 seemed to be the perfect title for a journal of new beginnings. Assuming those new beginnings are not in fact over, I'm planning to keep this blog going, mostly as a journal of juggling professional life and parenting teens with a marriage. And I am adding comment moderation. So with that disclaimer and a much overdue paint job to the blog, I bid you welcome to the new and improved different-looking Life 2.0.